Mr. Xu Yonghai (徐永海). Internet photo. On January 24, 2014, when all eyes were on the New Citizens Movement trials, in Tongzhou District, Beijing (北京通州区), police detained more than a dozen house church Christians and, two days later on January 26, 12 of them were announced to have been criminally detained. In recent days, rights lawyers have become involved in representing their case. On the afternoon of Friday, January 24, when Xu Yonghai (徐永海), the elder of the Beijing house church “Holy Love Fellowship” (圣爱团契) and 17 or 18 others were studying the Bible in the home of one of their members, the police descended on them claiming that they had received a “report about a gathering of many people.” The police took all but four old or sick ones to the local police station without showing any legal document. In the police station, each was interrogated two to three times. 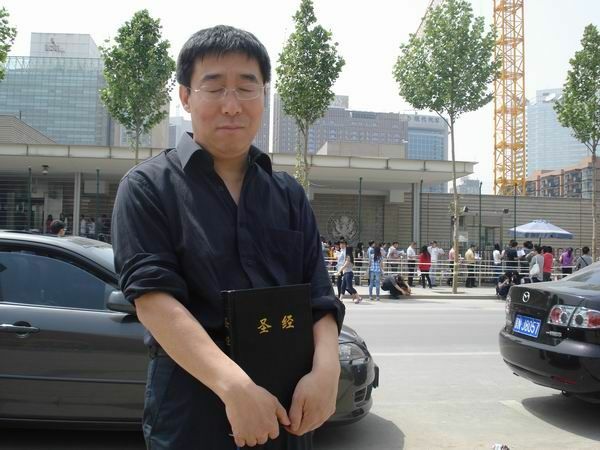 Mr. Xu Yonghai was released later but, in the morning of January 26, police officer took him away again. On the same day, the police announced the criminal detention of Xu Yong hai (徐永海), Yang Jing (杨靖), Yu Yanhua (于艳华), Xu Caihong (徐彩虹), Lu Dongli (吕动力), Ju Xiaoling (居小玲), Zhang Haiyan (张海彦), Wang Su’e (王素娥), Yang Min (杨敏), Kang Suping (康素萍), Yang Qiuyu (杨秋雨), and Wang Chunyan (王春艳) for alleged illegal assembly, parade and demonstration. They are currently detained in the Beijing Municipal First Detention Center. On February 11, Beijing-based human rights lawyer Liang Xiaojun (梁小军) met with Mr. Xu Yonghai at the detention center. According to the lawyer, for 17 days since his detention, Mr. Xu Yonghai has been fasting and praying, but he seemed to be in good spirits and he still wore his contagious smile as ever. Mr. Xu thanked everyone for their concern and regretted the detention of so many of his church brothers and sisters. 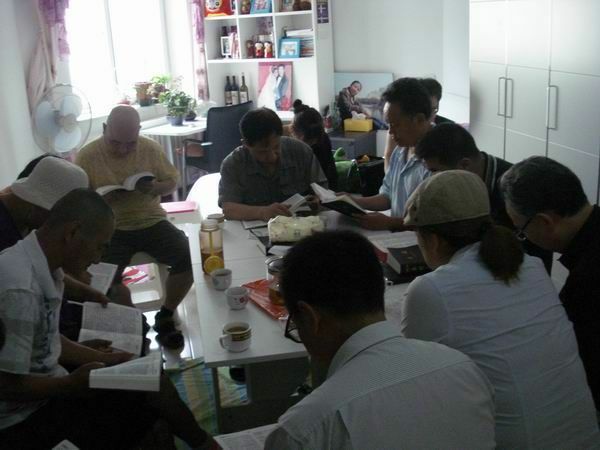 A scene of Bible study in Mr. Xu Yonghai’s house church. Internet photo. Mr. Xu Yonghai’s wife told the Chinese rights defense network weiquanwang (维权网) that, the family has not received any legal document although Mr. Xu has been criminally detained for over two weeks already. Mr. Xu Yonghai told weiquanwang that the Holy Love Fellowship began in 1989 and has existed for nearly 25 years, and that although he was put in jail twice for his belief, the Civil Affairs office has never asked them to register, nor has the group ever been identified as being illegal. More rights lawyers are getting involved in representing these house church detainees. Mr. Xu Yonghai graduated from Beijing Medical College in 1984, worked in several hospitals in Beijing, and became a Christian in 1989. In 1995, Xu was given two years of reeducation-through-labor for signing an appeal for democracy and rule of law to commemorate the 6th anniversary of Tian’anmen movement. In 2003, he was sentenced to two years in jail for helping a persecuted house church in the northeastern city of Anshan (辽宁鞍山). Since his release in 2006, he has often been subjected to house arrest and surveillance, and has not been able to resume his medical profession. By China Change in Religion, Reports, Rule of Law on February 12, 2014 .